This page will grow over time and contain some of the biggest and most important finds. Following is a list of valuable discoveries--many of which are documented in the book. 14-The number for Jesus the redeemer is the same number we find associated with Passover--The celebration of when the messiah came and saved the faithful when the rest of the land was in mysery over death. 17-The number of lifting up-The flood is a great example of how God lifted up and protected the faithful from the waters of the flood. Did you know the flood happened on the 17th of the month and the ark rested on the 17th of the month?--Gen 7:11 ...on the seventeenth day of the month, on the same day all the fountains of the great deep burst open, and the floodgates of the sky were opened. 22-Learning it is the number for Jesus the suffering servant helps us see all the chapter evidence for Jesus in the Old Testament. There are 22 chapter 22's in the Bible. 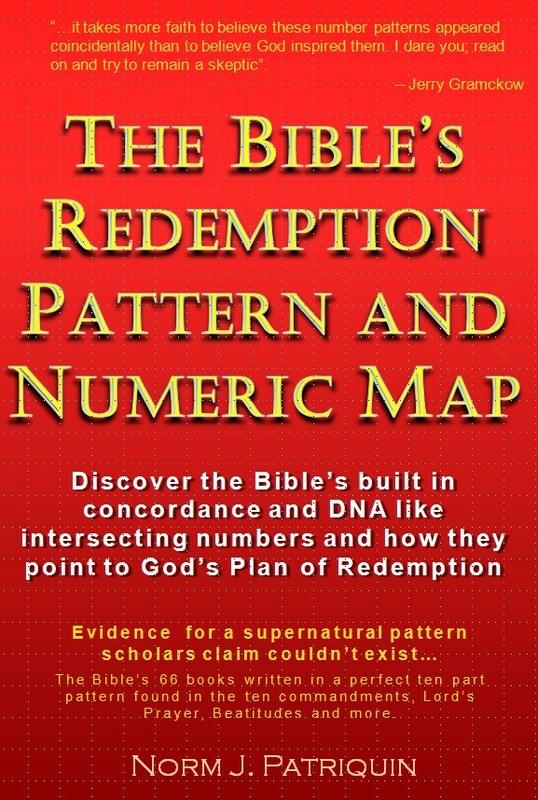 Check out Genesis, Psalms, Isaiah 22 for starters to see this evidence very clearly. 25-This number relates to the appearances of the Messiah on earth and seems to be related to the yearly celebration of Christmas on December 25. It does not mean Jesus was necessarily born on the 25-the Bible does not tell us that. But it can be the Christmas celebration is about the coming of the Messiah and not necessarily the day he was born. The 25,000th verse where Jesus is brought to the temple for the first time --Luke 2:26 And it had been revealed to him by the Holy Spirit that he would not see death before he had seen the Lord's Christ. 153-A number for being in the presence and lifted up by the Glory of God--John 21:11 Simon Peter went up and drew the net to land, full of large fish, a hundred and fifty-three; and although there were so many, the net was not torn. The 315 verse of the Bible and 9953rd verse at 2Kings 2:1 is the taking up of Elijah. This is one of numerous relationships of the number 53 to the Glory of god. 911--What we thought was a number made up by men now appears to be God inspired as well. 911 verses in the Bible speak of wrath on nations who turn away from God The 22,000th verse is Daniel 9:11 -- Dan 9:11 "Indeed all Israel has transgressed Your law and turned aside, not obeying Your voice; so the curse has been poured out on us, along with the oath which is written in the law of Moses the servant of God, for we have sinned against Him.